Morecambe charity A Breath for Life was hopeful that following a site visit with National Care Group in December, their bid to purchase the Holistic Centre would be finalised. However, honorary chairman Jane Dean said that sadly there remains “a small but important” issue of parking spaces; once this is resolved plans will move ahead. Next month, once parking has been finalised, the charity – which runs hyperbaric oxygen therapy to help improve the lives of severely brain injured children and adults – will be able to reveal their plans for expansion. However at the start of a new year it is always good to look back and reflect on the previous year. A Breath for Life is only one of 34 registered charities in Morecambe and Heysham. This number does not include the many not for profit organisations which are serving our local community. Jane said: “It must seem that charities are forever holding out a begging bowl, but ‘charity begins at home’ and without local support community charities would soon flounder and their many and important services lost. “Even with sufficient funds, all charities rely on volunteers, which make up a large proportion of the work force; so a huge thank you to local volunteers as without you nothing would happen. “The Charities Aid Foundation ( CAF) has recently published a review of charitable giving in 2018. “The UK is placed sixth in the top ten countries who donate to charity. “We were beaten to first place by Indonesia, Australia, New Zealand, USA and Ireland. “Back on home ground in the UK, CAF research found that three quarters of UK households used a charitable service ie 74 per cent during 2018 and that cash is the main way in which people give to charity. “A Breath for Life received £700 in Christmas gifts which was a huge contribution towards funds for future development. “2018 was the busiest year on record for the charity with 3,209 hyperbaric treatments to 767 children and adults which gave a total of 997 sessions. “The patient treatment sessions were up by almost 1,000. “The five chamber operators listened to many stories of illness, disability and indeed distress. “They were often reminded of the frailty of human life but were uplifted when improvements were celebrated. 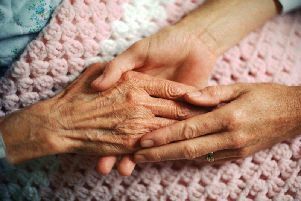 “Patients support one another and often a gentle touch or a kind word is healing itself.